Whilst we all value our own independence, some of us face circumstances out of our control which limit our mobility, thus having an impact on how independent we’re able to be. If this applies to you, then you may benefit from taking a look at Oak Tree Mobility’s 5 Top Tips on staying independent in your own home. Regardless of your situation, ensuring your own safety will reduce the chance of an accident, thus meaning you stand a much better chance of living independently. Evaluate your living conditions on a regular basis and always ensure your floors remain unobstructed. If you can, get handrails installed to help you move around the house – and avoid having rugs on your floor, unless they can be secured. 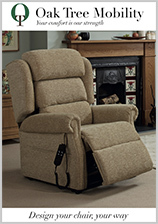 Not only will a quality recliner chair help ease aches and pains as well as enabling you to sit and stand with ease, it will also help ensure you can sit / relax in comfort, with as little pressure as possible being placed on your joints. This will help reduce stiffness and aid in mobility during moments when you’re more active around your home. Of course, it’s important to find a perfectly fitting chair in order to get the most benefits from your furniture – call us today and we’ll help you discover the difference such a chair can make to your comfort and mobility. Having reduced mobility doesn’t always mean you can’t remain active. Here at Oak Tree Mobility, we have worked with our personal trainer to compile a variety of chair exercises that you can do at home, to help maintain your mobility. Our exercises can help boost circulation, ease swelling and strengthen muscles. Take a look at our mobility exercises, and try them for yourself. Not only is it important to ensure you’re getting all of the necessary vitamins and minerals in your diet to keep you healthy, it’s also imperative that you keep hydrated. If you’re not drinking enough water before, during or after physical exertion, you could be left with more aches and pains than you started with. Keeping hydrated can help keep the cramps at bay, and will leave you less likely to suffer from fatigue. Another top tip is to make sure you’re as comfortable as possible overnight. We all know the difference a good night’s sleep can make – not only to our mood but also how we feel, physically. 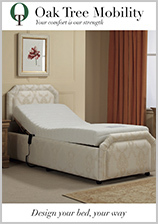 Imagine sleeping so comfortably at night that you wake up feeling revitalised and refreshed in the morning. With an Oak Tree Mobility adjustable bed, you can expect to sleep soundly and in comfort at night, saving your energy for the things you love doing in the day. There are, of course, other ways you can maintain your mobility and therefore independence, in and around your own home. If you have any tips we can add to this list, do let us know. 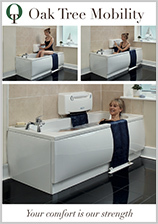 You can also give us a call on 0808 278 9520 to find out more about how we can help with our range of mobility furniture. We look forward to hearing from you.